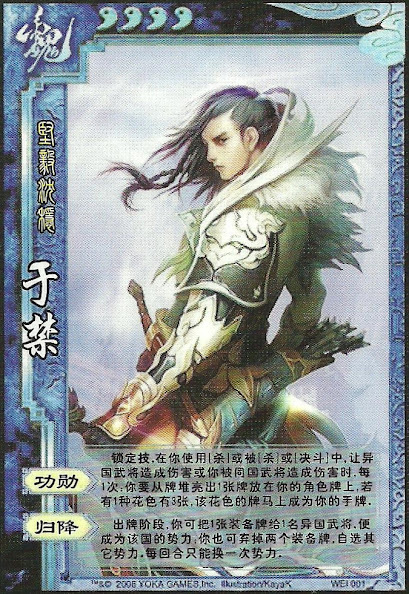 Every time Yu Jin attacks, is attacked by, duels, or is damaged by a player from a different country, or is damaged by a player from Wei, Yu Jin puts the top card from the deck in front of him. When he has three cards of the same suit, he takes those cards and puts them in his hand. Once per turn, Yu Jin can give a piece of equipment to a player from a different country. He then changes to that country. Yu Jin can discard two equipment cards and choose any country. He becomes that country. If Yu Jin is Wei and another member of Wei damages him, "Merit" is activated. No matter what country his is aligned with, he uses "Merit" when a member of Wei damages him. He will not draw if he is Wei and a member of Wei attacks him and he escapes. This is because of the special Wei part of the power. 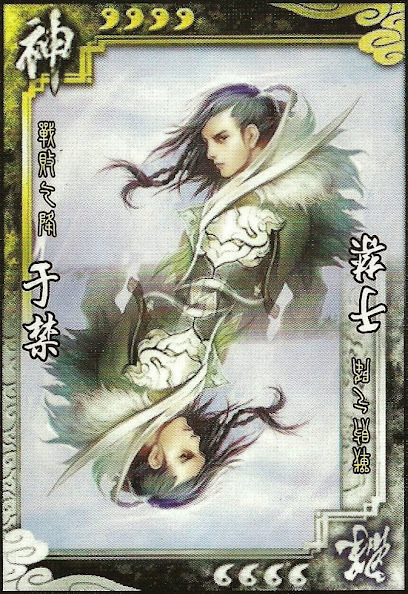 If another player from another country attacks and damages Yu Jin, "Merit" will activate twice. Once when Yu Jin is attacked and another time when he is damaged. The cards from "Merit" accumulate on the table until there is three of one suit. 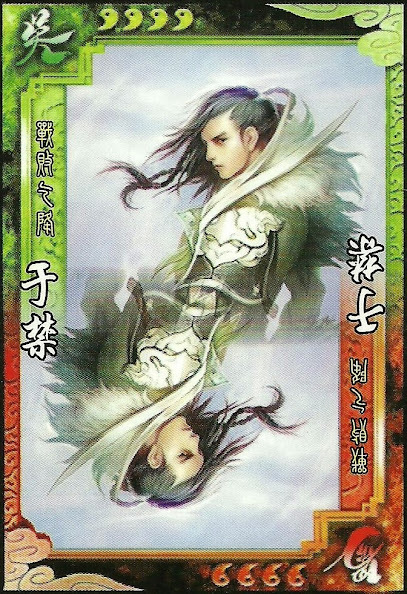 Once there are three of one suit, Yu Jin puts those cards into his hand. All the cards that Yu Jin doesn't take are left on the table.